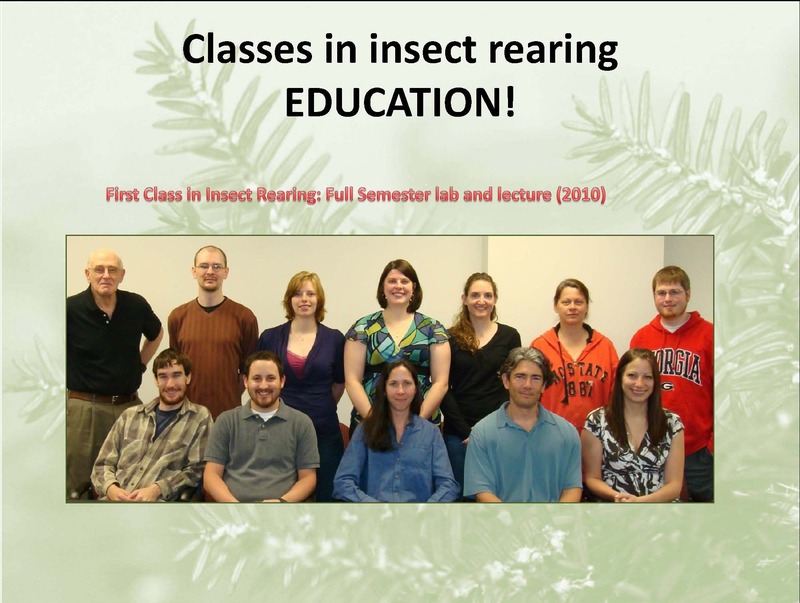 One of the major purposes of the Insect Rearing Education and Research Program at NCSU is education. I have pointed out frequently that insect rearing is unusual among entomology disciplines in being almost entirely done by people with nor formal background in the rearing profession–only on-the-job training. In the beginning of the 21st Century, through discussions with Drs. Frank Davis and Doug Inglis, and myself, we convinced the authorities at Mississippi State University to start a workshop series devoted to insect rearing, and the early success of that series has continued to current times, and I had expanded on that offering workshops in Tucson and more recently here at North Carolina State University. I had become dissatisfied with the brevity of the workshops where people had to travel to our sites from all over the world to get 5 days of rearing education, mostly by lectures and demonstrations and with some touring of facilities. 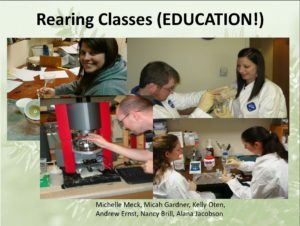 I had always felt that more time was needed to cover the basics of insect rearing, and I had designed and taught several courses in insect rearing for our graduate students in the Entomology Department at NCSU (now the Department of Entomology and Plant Pathology). These semester-long courses gave students a chance to have lectures, laboratories, and to do projects on their own (with my guidance) where they were asked to design their projects as rearing efforts that were integrated with some of the analytical techniques that were taught, including biochemical analysis, texture analysis, microscopy, and a statistical basis for all projects. These courses were well-received and highly praised by students in anonymous evaluations, so I am sure that this approach is valuable. I will post some of the answers to test questions to show how sophisticated many of the students in these classes were at understanding the complexities and intricacies of insect rearing. I also realized that the vast majority of rearing professionals and aspiring “to become professionals” can be students at NCSU or can attend the 5 day workshops taught on site, so I designed and launched courses online in the principles of insect rearing. After teaching a graduate seminar in rearing at NCSU, we started teaching lecture/lab courses in rearing (the first such class pictured above showing the whole class and some selected images of the students doing their hands-on projects = learning by doing).